The day you posted pulled pork sandwhiches? So did we! Guess what we ate for dinner last night.. Yup! Spagetti, garlic toast and salad!! We've still got a couple weeks before school gets out. But we're also looking forward to sprinklers...as soon as it stops raining. My kids did the same thing this morning! I like that sprinkler, too. Looks like fun. I wish school was out here. We have until June 10. I agree. It says it all! I love the picture. I'm all for being a protective mommy, but honey, I don't think they need the life preserver swimsuits to play in the sprinkler. OMG, sooooo cute!!!!! 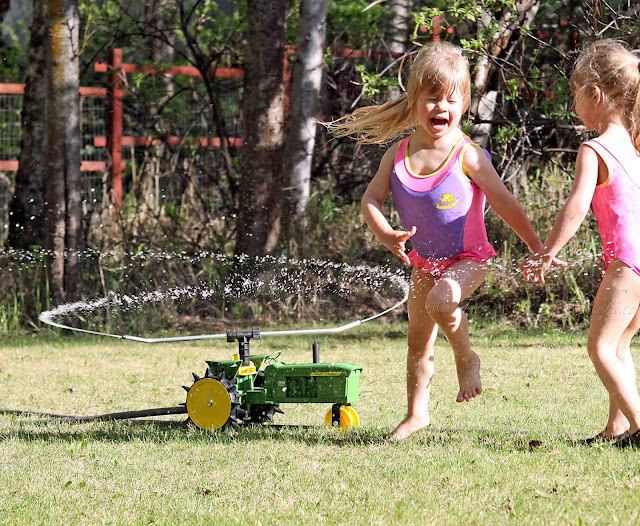 I love that the sprinkler is a little John Deere tractor!!! Cole and Bella get out of school in a couple weeks! Good question, Carmen. As far as I know, the school year up here has always ended in May (even when I was a kid). Most schools start back up in late August; some in early September. I assume that it's because our summers are so short, and we want to maximize our time in the good weather up here. Many families need their kids in May to help with the fishing boats, fishing sites, and farms (yes, we do have them up here!). That's a cool sprinkler! We had a day of fun with the hose ourselves - summer is wonderful!